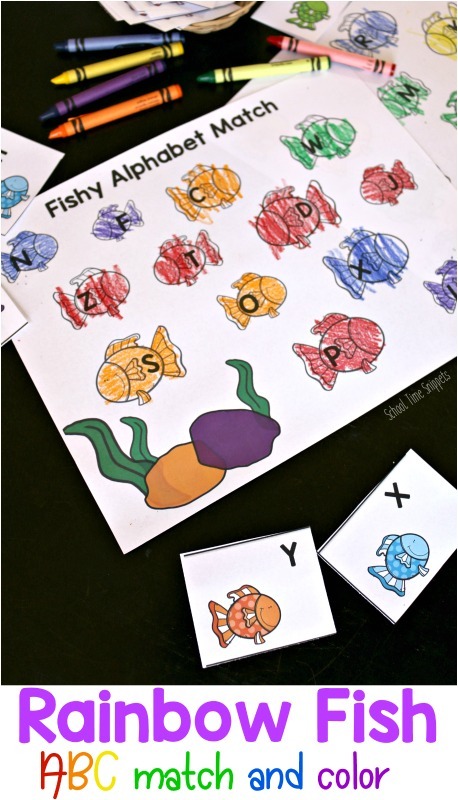 Use this colorful rainbow fish printable to work on letter recognition with your preschooler! 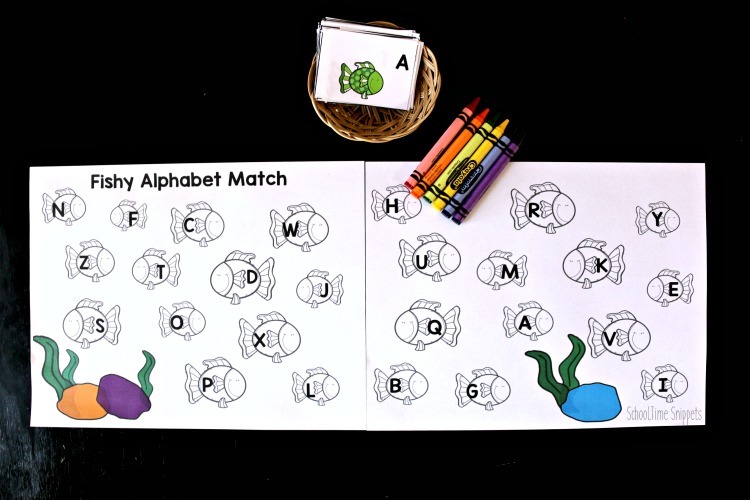 If your child loves to color, he/she will enjoy this cute alphabet activity: Match and Color Rainbow Fish! Enjoy this low-prep letter matching worksheet! This preschool alphabet activity is a fun go-along for the book, The Rainbow Fish or as a stand-alone activity for a fish or ocean theme... Or if you are just looking for a quick way to work on letter recognition! I've created this Rainbow Fish Letter Matching Activity to work on lowercase and/or uppercase letters. The matching recording sheet is a two page spread that contains 26 fish-- each fish has an uppercase letter of the alphabet in between the little fin and tail. Each letter is in a bold font, so should be easy to see. There are two sets of letter cards-- one set of uppercase letters and one set of lowercase letters. Decide which set of cards you would like your child to work, print the sheets, and cut out each fish card. Also grab a crayon for each color of the rainbow: red, orange, yellow, green, blue, and purple. Each card has a letter in the top right corner and a colored fish. 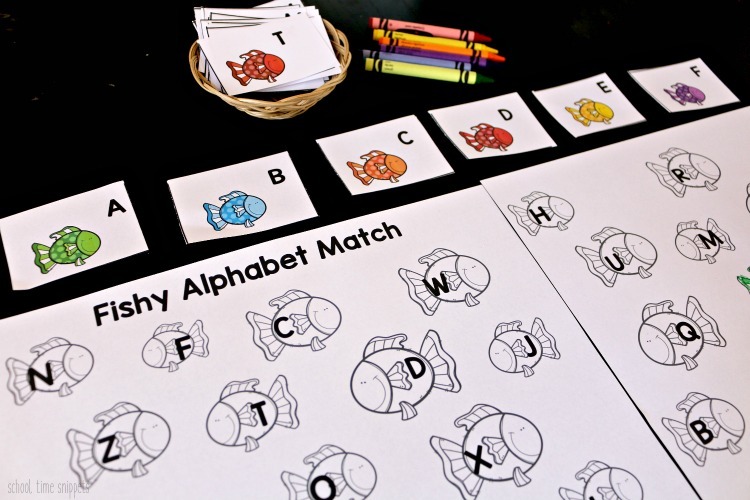 In this letter matching activity, your child will pick up a card and identify the color and letter and then find the fish on the recording sheet and color the fish the coordinating color. If your child picks up the letter A card with a green fish, he/she will find the fish on the recording sheet and color it green. 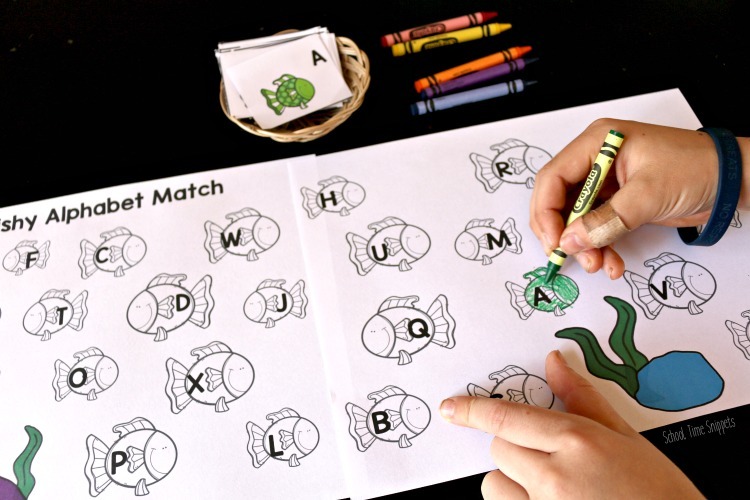 Continue matching the letters by coloring in the fish. Once done, your child will have created quite a colorful array of fish under the sea! I hope your preschooler enjoys finding the matching letter fish and coloring it in as much as mine did! It's a mix of letter recognition, I SPY, and coloring! 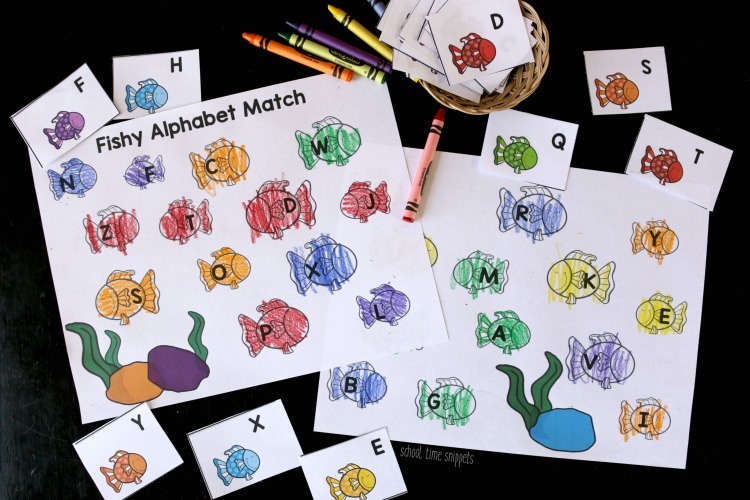 Try this low-prep letter matching activity with your preschooler! It's a great way to LEARN today! *do not copy, alter, host, or sell this printable. *enjoy this freebie and share with others by linking to our blog post! Join our newsletter & get access to all our printables! See our disclosure for more info! Alphabet Tulips Match & Color Printable -- same concept, but with flowers, instead! Perfect alphabet activity for spring or summer! Rainbow Snip & Sort Name Activity -- help your preschooler recognize the letters in his/her name while creating a rainbow! Also great activity to work on fine motor skills! Rainbow Fish Sun Catcher Craft -- another great go along for the book, The Rainbow Fish. Create your own with a paper plate. Yarn Wrapped Rainbow -- one of my all-time favorite activities! Create a beautiful rainbow from yarn. Another activity that sneaks in fine motor skills practice! Blotto Rainbow Craft -- have you made blotto art before? If not, try this easy rainbow craft!